I saw this beaut on Sunday while watching the U.S. Open. 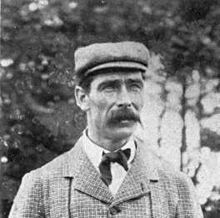 Joe was an English golfer who won the third U.S. Open at the Chicago Golf Club in 1897. According to golfika.com, that same year he challenged a man, who was to use a full set of clubs, to a match where Joe would only use his putter. He won the match. Wikipedia also doesn’t know when he died. It says “(1864-? )” next to his name, so he might be a vampire. This entry was posted in Sports Steesh and tagged 1864, chicago golf club, entertainment, Golf, Humor, Joe Lloyd, Moustache, mustache, PGA, sport, sports, vampire, wikipedia on June 20, 2012 by Los Bulls.